The trails in Juneau County are so diverse that you'll never get bored, from the hills to the valleys, the rivers and woods to the expansive flat-lands, you'll enjoy every moment. So let the adventure begin! Snowmobiling in Juneau County is a lot of things. It’s gliding along on a well-groomed trail with your friends on a clear, crisp day watching the shimmering trees zoom by. It’s traveling on a moonlight night with somebody special riding behind you as you wind your way to that favorite night spot. It’s stopping to watch a herd of whitetails or a flock of turkeys disappear in a flash or listening to the sounds of the woods, rivers and lakes before moving on. We have hundreds of miles of trails that are well-groomed and clearly marked thanks to the efforts of our local snowmobile clubs. 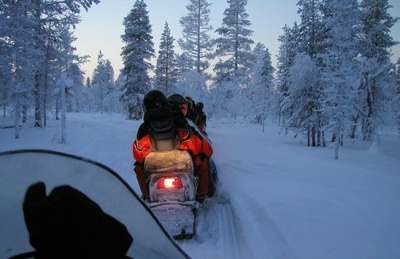 For information on the snowmobile trails conditions, call: 608-562-5737, and for information on snowmobiling opportunities in Juneau County Wisconsin, click here. Businesses that support our snowmobile trails are listed on the map below. Be sure to patronize the businesses that support the trails!